Welcome to the New World of Facebook Post-IPO. Now that Facebook Stock is publicly traded and grossly overpriced, according to pundits, and Marc Zuckerberg is laughing all the way to the bank, where does it leave the Facebook user? Particularly, the small business owners who relied on Facebook fan pages to engage with their fans and promote their products? It's time to pay the piper! That's right. Starting this weekend, Facebook offers the new Feature called Promote a post! Simply put, you can get more people to see your post if you pay. 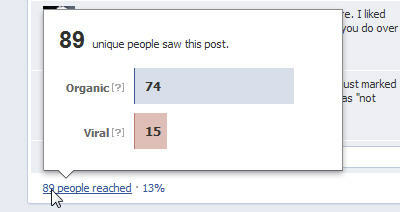 Uhmmm.... You mean all the people who hit the "Like" button on my page are not seeing the post in their news feed? Exactomundo. How can you promote what is already free? You see, when Facebook started, it promised instant connection with old friends, new friends, business contacts, customers, and fans. Slap a page up and ask people to hit the "Like" button. It takes only a nano-second to "like" someone and they will be able to enjoy your posts and updates whenever they engage with Facebook. Facebook grew virally as people invited their friends to join. In those halcyon days, you were treated to streams up updates and pictures of new babies, new cars, pets, and even what someone had for dinner. 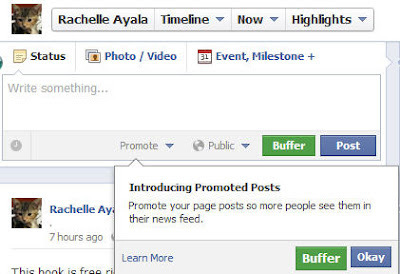 No longer will people who simply "Liked" your pages see your post in their newsfeed. Facebook ranks the people who "liked" a page by the amount of interaction they have with the page. 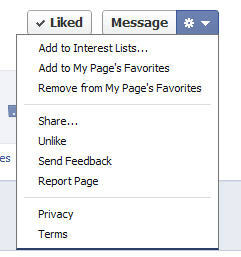 For example, if a fan clicks "like" often on your page, that fan moves up in the ranks. I don't know the secret formula (something called EdgeRank), I suspect there are tiers of fans. Each time you pay to promote, you lower the bar for the amount of clicks, likes and interactions required for that person to see your post in their newsfeed. One prominent author paid and said she only increased her reach by 9%. Now, this doesn't guarantee that your fan actually saw the post, just that it is in their newsfeed should they login and look. Pay Per View, Are we There Yet? So, how much do you have to pay to reach all your fans? Facebook is ever so helpful. They even have a pricing algorithm per number of people to reach. Let's see, $10 will get me an estimated reach of 1,500. So each person is worth .666 cents? [yes, I know I should round up, but that number 666 is positively diabolical]. Fortunately moi don't have many fans, but there are people with 50,000 fans. Supposing they wanted to reach 45,000 people, the same number they would have reached before Facebook started to limit their post visibility, they would have to pony up $300 per post! Now, $300 per post is peanuts to big guys with big hats and big advertising budgets, but to the mom-and-pop shops who put up a Facebook page and worked hard to build a following? Pay or don't play. 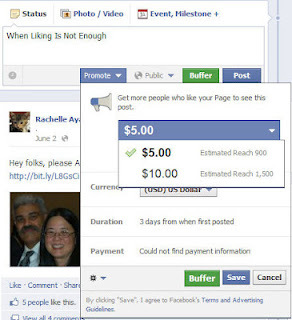 Then Facebook introduced ReachGenerator [where brands can pay Facebook to make sure their "fans" see content posted to brand pages] and those advertisers were like "wait, we've been paying you $10 CPMs to accumulate these fans now you tell us our posts were only reaching 16% of them and we have to pay you to reach more!?!" One person suggested posting funny pictures on their page every day to increase the number of people clicking "like". Another person said to spur it with a Giveaway. I'm not sure. In order for Facebook to retain value in Paid Promo, they need to keep a ranking of fans. The interaction is relative to the fans you have. Now, I don't have any insight into how they do it, but if I were running the business, I'd group fan interaction into tiers, if not a strict ranking, since such an algorithm would be prohibitively compute intensive to keep updated. Each payment releases the page to the next tier of interactions. Interactions are counted and tracked and possibly updated at some time interval, so that one fan moving up a tier displaces another fan to a lower tier. There are three things Fans can do, but it involves more than simply hitting the "Like" button. One is to Add the page to My Page's Favorites. 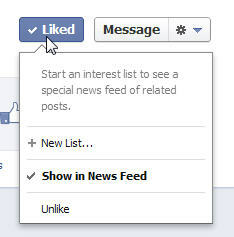 The second is to hover over the "Liked" button until a menu pops up and check "Show in News Feed". And the last is to create an Interest List and add all the Fan pages you want to various interest lists. I created one called "Rachelle Ayala's Book Community" and started populating the list. This list can be shared to the public. All these actions require more time from the person "Liking" your page. So, what is the value of a "Like" these days? About 2/3 of a penny. What do you think? Will Twitter charge per tweet once it goes public? Will you pay to promote your posts? How much and how often? Will you move to Google+? And most importantly: Do you "LIKE" Facebook? Ha, ha, ha. Why don't I message my 80 fans (every single one of them) and instruct them to hover over the "like" button so they'll be able to see my fan page posts? Know something? I never did like Facebook much. Now I'm liking it less. But wait, you'll soon see friends fleeing to Google + as if the Devil is after them. And it is. Great info, but Clare, in the long run, I really don't care much about Facebook, who sees me on there, which people like me, or how to reach them. Facebook overall is a place people socialize and tell what they're eating for dinner. People looking for books to buy don't search Facebook. Potential readers are not going to buy your books because they liked your author page. I realize some people spend vast hours making Facebook work for them, but very few potential fans go looking for you on Facebook. the ones who will go check out your page are probably already your fans, so I feel my time is wasted (and money) if I spend more than ten minutes a day on Facebook. the place readers go to read is Goodreads, and their ads, for me, have resulted in huge exposure for very few dollars. And Twitter, of course, as we both know, is THE place to promote and reach potential readers. Since I've increased my exposure in Twitter in a huge, way, I'm seeing tweets almost daily of people not just RTing my posts and others' about my books, people are telling me they've bought my book and are reading it, or love it and have posted a review. I never get this on Facebook. So those are my two cents. I think people get way too worked up about FB when it's not the best place to promote as an author. Oh, so wrong. People interested in book join groups on FB just to find out what is out there and what's new or interesting to them. 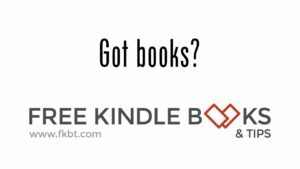 Don't discount pages like KindleMojo or Books or Bust. They DO bring in readers! As to these changes, I don't know exactly what they'll mean for such site, but I'll use free promo for my books anywhere I can get it. Two new readers are two new readers. I'd prefer 20 but two will do for free! I loved Facebook when I joined. But then when they started to change things it became annoying more than anything. For the pat year my author page, and reading everyone else's page has been great, but now with another change... Back to annoying. I don't knowif I could be bothered to do anything but leave , and let my page sit dormant for a while and see what pans out. I agree with everything you said. But about Goodreads, I just don't get it. I've been a Goodreads member for several years and I have to say I just can't figure it out. It's about as unintuitive as a website can be (IMO) and the technology at its core is about 20 years out of date. It looks and operates like a throwback to the '80s and early '90s. I have my current novel listed on Goodreads and the system doesn't even know it exists. If I go to page with an "add you book" window and try to add my book (to a list or to a page, etc.) it says "No book found". I've run three ads on Goodreads that never resulted in a single sale and barely resulted in any "views". I think Goodreads is basically a GREAT idea. I just wish someone could come up with a more up-to-date, more intuitive version of it. I've picked up a bunch of fans through facebook several years ago and I've seen that slowly decrease over time because of the way they keep changing things on facebook. How I've made new fans is through people finding me through other people. I make new fans on twitter and that is picking up, but not the same as facebook, though I'm sure they will switch places at introducing people to my books at some point in the near future. I have a facebook page, but I don't do much with it. Most of my interaction comes from my blog. I guess if it starts costing moey, I will pay attention even less. My advertising budget is very low at the moment. I agree with all your comments. Interaction has really slowed since changing to the timeline format. This is true both with the fan page and the regular personal page. What happened with the fan page is that other people's posts are no longer streamed, but segregated in a small box. Where's the interaction? On the personal pages, people are now hesistant to post on your wall. It seems an "invasion" of your timeline. So again, interaction decreases. No more little, "Hi, Happy Monday, how are you doing posts?" Facebook timeline seems more like a scrapbook devoted to the individual, rather than a wall where people can post and interact with others. Good post, Rachelle. I have a fb fan page but have wondered at the need since I always kept my personal page professional. I'm almost at the point of abandoning the fan page. It takes effort to maintain and I'd rather people were coming to my blog anyway.